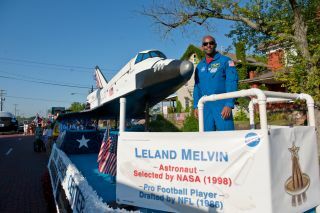 Astronaut Leland Melvin waved to the crowds from the NASA Glenn Research Center float during the 2010 Pro Football Hall of Fame Festival Timken Grand Parade on Aug. 7, 2010. On Saturday (Sept. 23), former NASA astronaut and National Football League player Leland Melvin posted an open letter to President Donald Trump on Facebook, criticizing many of the president's recent comments and tweets regarding NFL players who kneel during the national anthem as a form of protest. On Friday (Sept. 22), Trump gave a speech in Florida in which he suggested that NFL team owners should fire former San Francisco 49er quarterback Colin Kaepernick and other players who choose to kneel at games during the national anthem. In the following days, the president also tweeted comments saying he considers kneeling during the anthem disrespectful to "our Flag and Country," and that viewers should boycott the NFL until those players are fired, suspended or made to stand. Melvin specifically criticized the discrepancy between Trump's condemnation of Kaepernick's actions and the president's earlier comments about the participants at a white supremacist rally in Charlottesville, Virginia, in August, which resulted in the death of a counterprotester. Melvin referenced Trump's comment that there were "nice people" participating in the rally. That comment, "verses what you say in condemnation of an unarmed black man peacefully protesting by exercising his constitutional First Amendment rights by silently taking a knee, is appalling, unnerving and reprehensible," Melvin wrote. Over the weekend, NFL leaders and players have publicly supported the players' right to peacefully protest and kneel during the national anthem; some have called the president's comments "divisive." On Sunday (Sept. 24), players on multiple teams kneeled or locked arms in solidarity during the national anthem. Some players sat on the bench or did not appear on the field during the national anthem. On Sunday evening, NFL Commissioner Roger Goodell said he was proud of the league's response. "I believe in the Declaration of Independence and the Constitution of this country," Melvin's letter to the president begins. The former astronaut said in the post that he believes in the principles described in those documents, including "life, liberty [and] justice for all," and citizens' rights to "freedom of speech, religion, assembly, press and petition," even though, Melvin notes, those documents originally "only applied to a select group of people and not ones that looked like me." Melvin flew on two NASA space flights aboard the space shuttle Atlantis: the STS-122 in 2008, and the STS-129 in 2009, and logged more than 565 hours in space. In October 2010, he was named associate administrator for NASA's Office of Education, and served as co-chairman on the White House's federal STEM (science, technology, engineering and mathematics) Education Task Force. He retired from NASA in February 2014, but has continued working to increase the number of women in STEM fields. Melvin attended the University of Richmond, where he played football from 1982 to 1985, and was drafted by the Detroit Lions in 1986. An injury, however, stopped him from ever playing a game with the Lions. He was later recruited by the Dallas Cowboys but again suffered an injury before he could play. "I served my country not in the military but as 1 of 362 American Astronauts that have explored the universe to help advance our civilization. Not just Americans but all humans," Melvin wrote. "I also was briefly in the NFL and stood for the National Anthem with my hand over my heart. What makes us great is our differences and respecting that we are all created equally even if not always treated that way. "Looking back at our planet from space really helps one get a bigger perspective on how petty and divisive we can be," Melvin said in the letter, adding that perhaps Trump should take a trip to the International Space Station and "see what it’s like to work together with people we used to fight against, where your life depends on it. See the world and get a greater sense of what it means to be part of the human race, we call it the Orbital Perspective." Melvin concluded the letter by saying, "Donald Trump please know that you are supposed to be a unifier and a compassionate and empathetic leader. If you can’t do the job then please step down and let someone else try. I pray that you do the right thing. May God bless you."